You will be given a reference e-book to read which has 160 pages And the test will be based on that e-book , you can take final test within 1 year of purchase. Plumbing refers to the system of drains and pipes that are now installed in a building for the purpose of distributing water for heating and washing, drinking and removing waterborne wastes. It involves the installation and the repair of piping systems and plumbing equipment and fixtures including water heaters. If you want to become an expert in this field, then it is advisable for you to improve your skills and expertise when it comes to working with tubing, pipes and plumbing fixtures installed within the system. Plumbing has become one of the most essential parts of a developed country or economy because of the constant requirement for clean and safe water and the need to properly collect and transport wastes. It should be noted that the plumbing system is distinguished from sewage systems and water supply because plumbing only serves a single building while the latter works by serving an entire city or a group of buildings. Plumbing systems at present operate with the help of various materials. These include a network of high pressure pipes and pumps installed in buildings that are usually made using brass, plastic, copper and any other materials that are not toxic. The drain and vent lines that are also part of the system are usually made of steel, plastic, lead or cast-iron. Other materials and components that form part of a plumbing system are pipe fittings, pipe or tubing, elbows, unions, tees, valves and pipe hangers and strapping. If you want to master every topic linked to plumbing, then be aware that enrolling in the plumbing certification course which is now available at Brainmeasures can definitely help you out. You can expect this plumbing course from Brainmeasures to cover all the topics that you need to understand about plumbing systems so you will no longer have a difficult time performing your tasks as a professional in this field. This certification course allows you to access a kind of plumbing training which is guaranteed to work in molding you into a highly efficient and effective plumbing expert because of its comprehensiveness when it comes to supplying information about how the plumbing systems work, what are the materials and major components that form a huge part of it and how to maintain the system’s good condition. 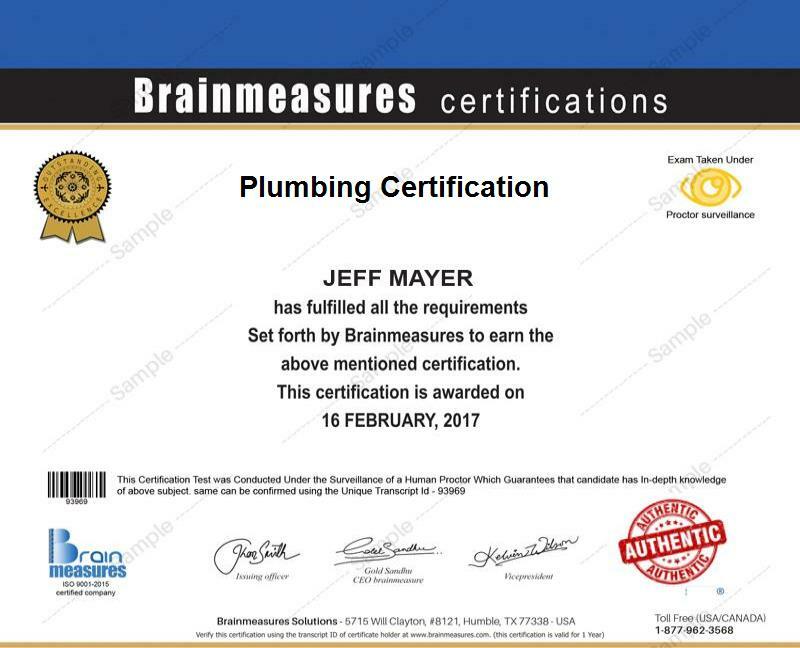 You will never regret acquiring your plumbing certificate from Brainmeasures because this is a good indication that you are one of those who have the strongest background in the field. How to deal with problems in pipes? The comprehensiveness of the plumbing certification course offered by Brainmeasures is one of the major reasons why it continues to benefit hundreds of individuals and professionals. You can expect this program to be more beneficial for designers, contractors, engineers, architects, master plumbers, plumbing and heating installers, builders and any other aspiring plumbing experts who wish to generate more knowledge and skills in the field. Earning an even higher salary is also possible after you successfully complete a plumbing certification course. You can expect your plumbing certification to help you get the position of a plumbing inspector which allows you to earn around $35,000 to $62,000 per year. You can also work as a mechanical plumbing engineer which offers an annual salary of around $65,000 to $77,000. If you decide to work as a plumbing and drainage designer, then you can expect this profession to let you receive around $52,000 to $110,000 yearly.